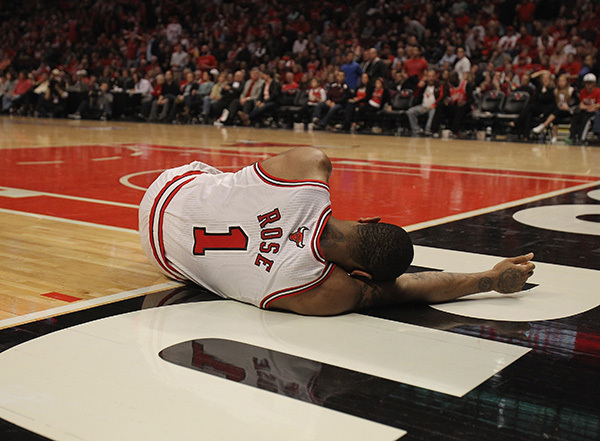 Derrick Rose #1 of the Chicago Bulls lays on the floor aftrer suffering an injury against the Philadelphia 76ers in Game One of the Eastern Conference Quarterfinals during the 2012 NBA Playoffs at the United Center on April 28, 2012 in Chicago, Illinois. I learned that Canon finally figured out how to make a decent camera. It’s wonder I still have a job after the last two generations of cameras. I learned how to work those cameras too. I learned about global warming when it hit 80 degrees in Chicago in March. I learned that Ron Vesely is in a “band.” Nice he has the time to devote to it while the rest of us are actually working. I learned that Brad Mangin has a cell phone with a camera. I learned I was sitting in the right place when Derrick Rose leaped and blew out his knee right in front of me. Then I learned it was time to say “gooby” to the NBA season in Chicago. I learned that Bruce Bennett knows how to shoot something besides hockey. Good thing too. I learned how to tweet with the help of grandpa Chris Covatta who also taught me they make vodka in Dripping Springs, Texas. I learned that no matter how long I live, I will always dream of never having to drive to Green Bay again. I learned that no matter how long I live, the Cubs will always stink. Well, actually, I already knew that. I learned that no matter how long I live, Notre Dame will have the worst sidelines in America to work. Well, actually, I already knew that too. Roll Tide. I learned that Jay Cutler will never be an elite NFL quarterback because he’s always trying to make a play while getting thrown to the ground by some big sweaty man. I learned that when the news side at Getty Images asks me to work an election night rally, that I’d be on a scissors lift, wobbling for an hour and a half. And it would be a tremendous experience. I learned that my friends and colleagues on the east coast, like my friends in New Orleans, are strong-willed survivors who deserve our help and support. I learned that, top to bottom, I still continue to work for the best people in the business. I learned that if you give a 7 year old an inch, it’d actually be about 7 miles. And…I learned how sad an event like what happened last week in Connecticut could make me feel. Here’s to never having something like that happen ever again. Hug your kids every day with that in mind…even if they take 7 miles. <>Jonathan Daniel is a Getty Images staff photographer based in Chicago. Check out JD’s work at his SportsShooter.com member page: http://www.sportsshooter.com/members.html?id=602.